← Was Jesus a conspiracy? HuffPost has an interesting Sleep 101 article up. Sleep is anything but a waste of time. While many people think of catching ZZs as the body “shutting off” until morning, nodding off actually activates a complicated process that helps you feel rested and healthy the next day. Scientists divide sleep into four stages — each full sleep cycle takes about 90 minutes to complete, meaning we cycle through roughly five rotations during 7.5 hours between the sheets. 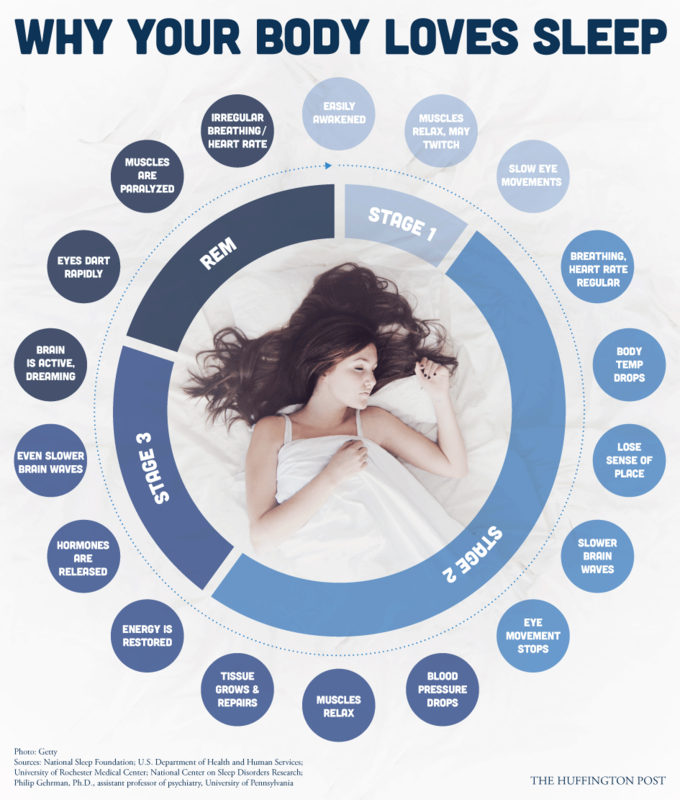 The amount of time spent in each stage of sleep varies by cycle, with more deep sleep taking place earlier in the night and more dreaming sleep in the second half of the night. In honor of Sleep Awareness Week, here’s a closer look at some of the amazingly complex things your body does every night. via Your Body Does Incredible Things When You Aren’t Awake. I’ve commented before that I think death is like an eternal sleep. People often counter that they dream during sleep but wouldn’t in death, which is true, but it pays to remember that most of the night, you aren’t dreaming. During that time, our consciousness is non-existent. We don’t actually experience that non-conscious state, only the after effects of it. The last instant of awareness before sleep is immediately followed by the first moment of dreaming or wakefulness. We fear the final destination of non-consciousness, but not the visits there. This entry was posted in Zeitgeist and tagged Circadian rhythm, Conditions and Diseases, Consciousness, Death, Health, Organizations, Sleep, Sleep Awareness Week, Sleep Disorders, Slow-wave sleep. Bookmark the permalink.